Mapping a Mushroom Trip, Speedy genes and Magnetic Soap! Robin Carhart-Harris, Imperial College London; Emmeline Hill, University College Dublin; Julian Eastoe, University of Bristol; Coren Apicella, Harvard Medical School. How hallucinogenic drugs, such as magic mushrooms, affect the brain has been mapped in humans for the first time. 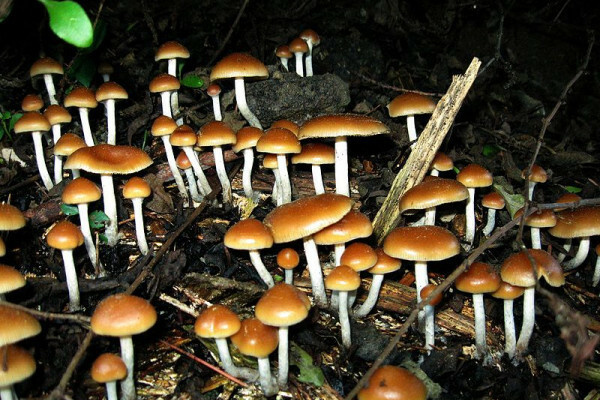 Using an fMRI scanner,, researchers watched how the brains of 30 volunteers responded to doses of psilocybin - the active ingredient of magic mushrooms. The drug suppressed the activity of certain 'hub' regions of the brain that control how information flows between different brain regions. Areas known to control mood were also affected..
Robin - The surprising result was that we only saw decreases in brain activity. We didn't actually see any increases anywhere in the brain. So the larger the drops in brain activity, the more intense the psychedelic effects of the drug. And then that they were in regions associated with the sense of self and also regions that's over active in depression because people are very self-conscious and self-critical in depression. The implication then is that the drug may be effective in treating patients with depression. gene for speed in modern racehorses has been traced back toa single Mare that lived 300 years ago. Since then, selective breeding for speed and stamina has led to a very high prevalence of a favourable "C-variant" of a gene called myostatin, which gives thoroughbred racehorses a sprinting boost. Analysing the DNA of 593 horses from both Eurasian and north-American regions, Emmeline Hill from University College Dublin discovered where this speed gene came from in the first place and how it has spread. Emmeline - The speed gene proliferation in the population is a result of the success of a horse called Northern Dancer. But also, the study shows how very quickly, economically valuable alleles can move within a population. This demonstrates that the power that breeders have to shape the diversity of the variation within their own populations and to be able to very quickly - with the knowledge of the genetic types of their horses - shape and develop a population of horses of the type that they want. magnetic soap has been developed by scientists at the University of Bristol. By combining iron-rich salts with the water-soluble component of soap, Julian Eastoe's team created soap particles with metallic centres meaning the soap can be controlled with a magnetic field. Julian - There are various applications you can imagine. One which is quite obvious is the possibility to use magnets and these soaps to recover oil in oil spills for example. There are smaller scale applications. You can imagine trying to clean components of a machine or engine for example. Normal soaps could never get in to the nooks and crannies, but it now becomes possible using magnets to guide the soapy solutions into the parts which other soaps cannot reach. Social networks were crucial to the evolution of cooperation in ancient hunter-gatherer populations. Studying how the Tanzania's Hadza people - who are one of the last surviving hunter-gatherer populations - Coren Apicella from Harvard Medical School found that ties between individuals were based on the tendency to cooperate and formed between both kin and un-related members of the group, leading to the altruism and cooperation also needed in society today. Coren - Well a lot of the properties you see in our networks also hold true in the Hadza. Popular people tend to be friends with other popular people. You see a person's friends tend to be friends with one another. The further away you go geographically, the less likely you are to be friends with a person and cooperative individuals preferentially form ties with other cooperative individuals. So these findings provide crucial insight into the evolution of cooperation and altruism in humans and suggest that social networks have been a fundamental part of human life since ancient times.